2018 Update: Wingspan closed on 23/3/18 and is moving to a new site. A fundraising effort is underway to open the doors of the new facility. You may handle a form of the New Zealand falcon or karearea every day without realizing – it’s the bird on the back of our $20 note. 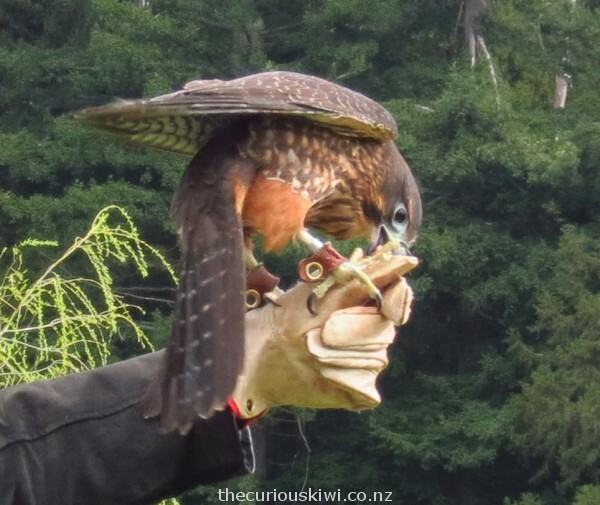 If you want to handle a falcon for real you may get the chance at Wingspan Bird of Prey Centre in Rotorua. Mike’s hand shot up with the rest of the crowd when there was a chance for Atareta the falcon to perch on the gloved hand of volunteers. Mike’s hand was one of many Atareta was happy to stand on, but she was determined to get the food he was holding. They’re a mercenary bird the falcon, it’s all about food for them and they’re equipped with some good tools to capture their prey. They can see up to eight times as far as we can which is evident when you watch a flying display. Atareta flew off into the trees, we sat there wondering if maybe this would be the day she wouldn’t come back? Not today, she was just watching and waiting for food to appear on the end of the falconer’s lure before swooping down to capture her reward in her sharp claws. I arrived at Wingspan knowing nothing about the falcon, I was surprised to learn that they are rarer than the kiwi. One of the falcon’s major threats is deliberate shooting as they prey on birds like ducklings and chickens. Life expectancy isn’t long for 75% of the birds, they don’t make it to their first birthday. Further reading found research that suggests vineyards could play a role in falcon conservation. Falcons have been used on vineyards to scare off and/or eat birds like starlings that damage grapes and cause huge dollar losses to vineyard owners. The research showed that falcon chicks especially benefited from being raised on a vineyard, so it could be a win-win for falcons and vineyard owners. Palliser Estate Vineyard in Martinborough recently introduced three falcon chicks from Wingspan as future pest deterrents. If you’re keen to support falcon conservation by raising a glass of wine, Lake Chalice Wines have a falcon emblem on their bottles and financially support the work of Wingspan Bird of Prey. 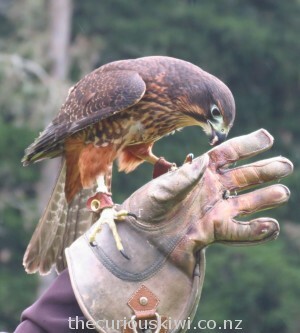 Although Wingspan’s main focus is the falcon, there are also harrier hawks and moreporks in the avaries. Harrier hawks are the birds you’ll often see scavenging for road kill. A permanent resident at Wingspan is Tahi, an Australian barn owl. Tahi arrived with a broken wing that had to be partly amputated, leaving her flightless. 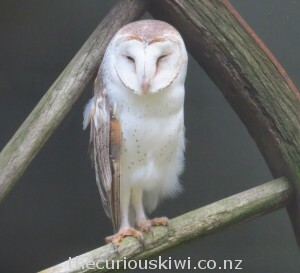 Tahi is the Maori word for one, she’s the only Australian barn owl in captivity, and how she got to New Zealand is a mystery, so she’s definitely one of a kind. Visiting Wingspan Bird of Prey is a one of a kind experience in New Zealand and it’s a chance to see a conservation programme in action. The staff we met were keen to share their knowledge and it was obvious how much they enjoy their work and are dedicated to the birds in their care. Wingspan is at 164 Paradise Valley Road, Ngongotaha, about thirteen minutes drive from downtown Rotorua. Opening hours are 9am – 3pm, 7 days. We highly recommend you time your visit to see the flying demonstration at 2pm. Adults $25, children $10, seniors $20. 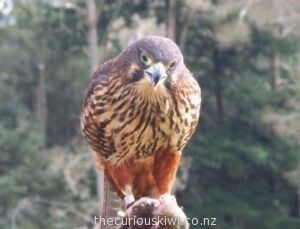 This entry was posted in Rotorua, Short Walks, & Wildlife, Unusual New Zealand and tagged NZ falcon, Rotorua, Wingspan Bird of Prey by thecuriouskiwi. Bookmark the permalink.